St Peter’s Square (Piazza San Pietro) in the Vatican City State is one of the most famous squares in the world, which houses over 300.000 people. It was designed by Gian Lorenzo Bernini and has dimensions of 320 meters long and 240 meters wide. The square was named after Saint Peter, an apostle of Jesus and the first Catholic Pope. The construction of the square took place between 1656 and 1667 by famous sculptor and architect Bernini under the commission of Pope Alexander VII. As soon as the Pope was elected, the project of the square was created and working process was begun, following Alexander’s detailed instructions. The piazza has the trapezoidal shape, which creates a heightened perspective for a viewer leaving the basilica. 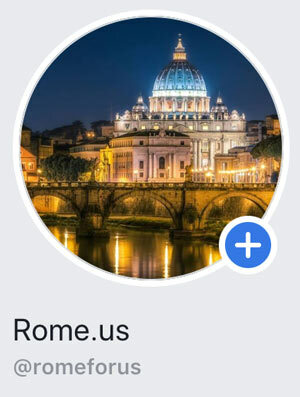 Moreover, according to the Lateran Treaty (1929), the area of Saint Peter’s square belongs to the authority of Italian police for the control of visitors, despite the fact that it is part of the Vatican City State. Saint Peter’s Square has borders from two sides by sei-circular colonnades. According to Bernini, these colonnades represent the stretched arms of the church which embraces the world. To the left and right of the obelisk you can see the circular marble plates that indicate the foci of the elliptical square. Interestingly, when you stand on either of these plates and look at any colonnade in the square, it will look as if there is only one row of columns instead of four. This trick shows Bernini’s talent not only as a sculptor or architect, but also his knowledge of geometry. Of course, the main building of the square is St Peter’s Basilica with its impressive dome. 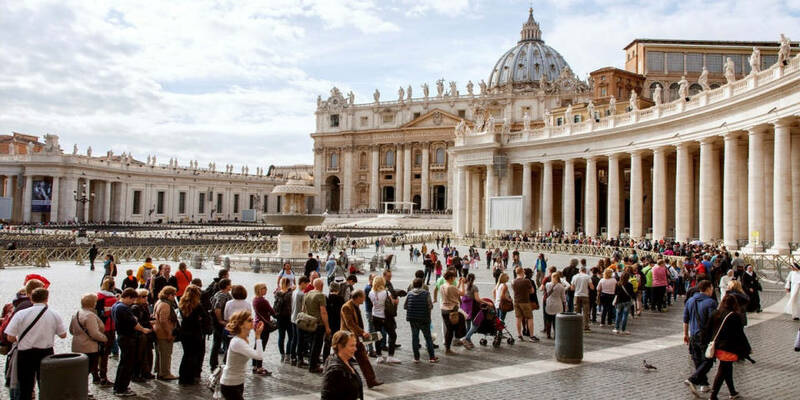 There are always long queues in the square because people from all around the world come daily to visit this amazing square and the biggest church, which was built between 1506 and 1626 and borders St Peter’s Square to the west. Moreover, you can see representatives of the Pontifical Swiss Guard during your visit to the smallest government in the world and even ask them a ticket to the Papal Mass, if you have more than 2-3 days in Rome. The square is spacious and there are many details worth of attention. 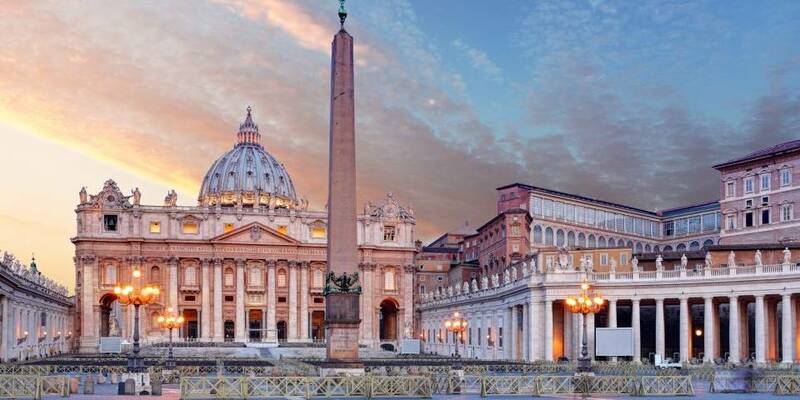 In the centre of Saint Peter’s Square stands the obelisk, which is 25.5 meters tall or 41 meters including the pedestal. It was carried to Rome from Heliopolis in Egypt in 1586 and has an interesting history. The obelisk was built for Cornelius Gallus, who was the city’s prefect. In 37 AD Emperor Caligula asked to move the construction to Rome with a special ship. The obelisk was installed at the spina of the Circus of Caligula, which later became the Circus of Nero, located on the territory of current Vatican City State. 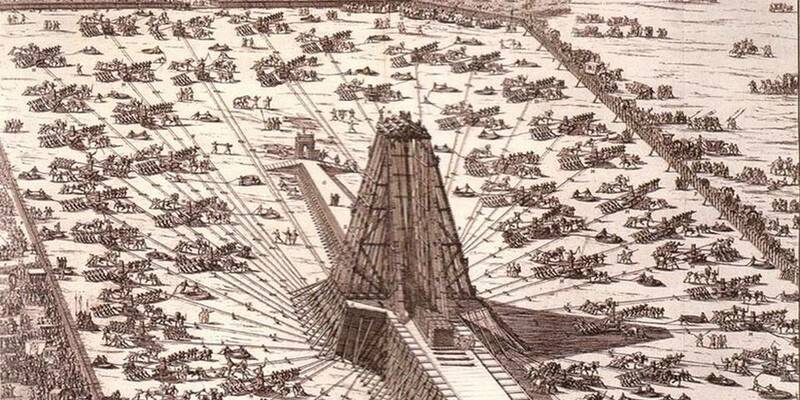 After several centuries, in 1585, Pope Sixtus V decided to move the obelisk to its present location, which is about 300 meters from the previous point where it stood. The relocation became a serious task, where even Michelangelo claimed that was impossible. However, the Pope commissioned Domenico Fontana with the transportation to realize his idea. It took 900 people and more than 100 horses to relocate the obelisk. 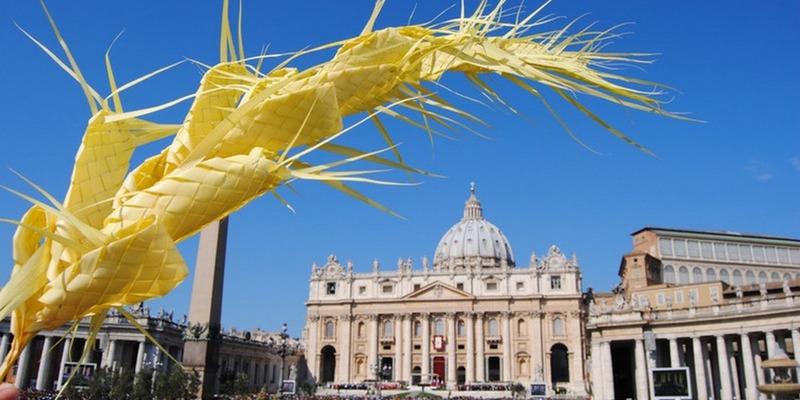 But during the process of moving it, the Pope forbid anyone to speak in the square, since there were too many visitors who wanted to see the process of realization of the project, which seemed unbelievable. However, the ropes were on the verge of breaking and people became scared that the obelisk can fall down. One sailor yelled against pope’s order:“Water on the ropes!” Fortunately, the workers heeded his advice. The water cooled down the ropes and the sailor saved lives of many people and the obelisk itself. Despite the fact that the sailor broke his decree, Sixtus V decided not to punish him, but instead, the pope thanked the man and rewarded him. The sailor asked that his family’s farm in Bordighera supply the palms for Palm Sunday every year because it was their family business. One of the first things that catches your attention when you come to the square is an impressive colonnade of four rows. There are 284 columns and 88 pilasters that flank the square. The Doric columns are 20 meters high and 1.6 meters wide. Moreover, there are 140 statues of different saints created in 1670 by famous Bernini and his students. 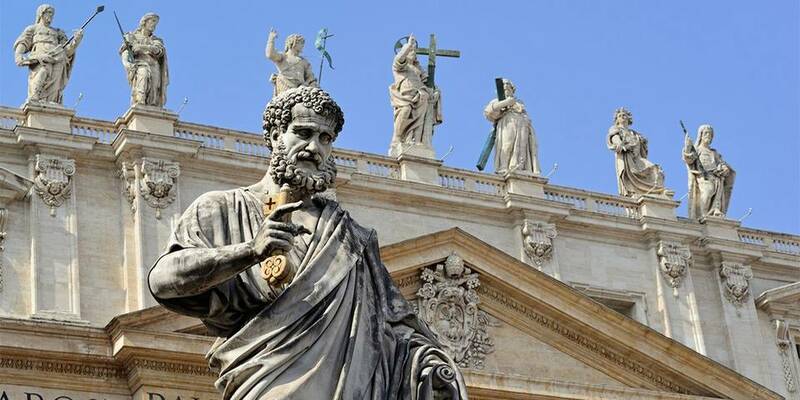 The statues depict popes, martyrs, evangelists and other important religious figures. There are two fountains in the square: one of Gian Lorenzo Bernini (1677) and another one of Carlo Maderno (1613). To maintain symmetry of the fountain by Maderno, Bernini decided to create an identical copy of the fountain on the left side of the square. 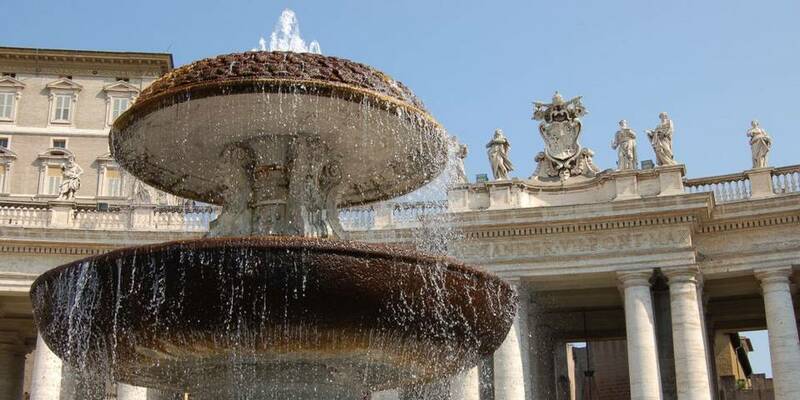 Consequently, the fountain was created by Carlo Fontana, according to the project of Bernini. Masses with the Pope are celebrated in St Peter’s Basilica, Saint Peter’s Square or both together. Most of the masses are inside the Basilica, which has a huge capacity and can host more than 15.000 people. The Holy See issues different kind of tickets: for Cardinals, Governors and Diplomats, Bishops, Priests, special guests and public tickets. Moreover, for most of the Masses you will need to have a ticket. You can get it for free directly from the Swiss Guards in St. Peter’s Square at the “Bronze Door” from 8 am until 8 pm (summer time) and from 8 am until 7 pm (winter time). Vatican Military – Who Protects the Pope?